Just a quick note to announce that registration is open for the 12th annual Civil War Forum Battlefield Conference, to be held March 27-30, 2008. This year we’ll cover Sherman’s 1864 campaign for Atlanta, from Rocky Face Ridge to the Battle of Jonesboro and surrender of Atlanta. As always, we’ll cut off registration after we’ve filled one bus. I'm not trying to sell stuff on this blog (and as I said in the very first post, I'll never tell you what I had for breakfast, I respect you that much), so you won't read much more about the Atlanta conference here, but faithful readers can benefit from this tip-off (up-to-date details can be had here). I’ve been looking forward to putting together an Atlanta conference ever since the Forum began these yearly outings. It’s a particular interest of mine, dating back to before Ted Savas and I published The Campaign for Atlanta & Sherman’s March to the Sea: Essays on the 1864 Georgia Campaign, Vols 1 & 2, 1994 (used copies of which are still floating around). Truly a collector's item, what with the 3-color pocket maps by Bill Scaife on the inside front cover (not surprisingly, some folks removed those maps before passing on the book. Who could blame them?). 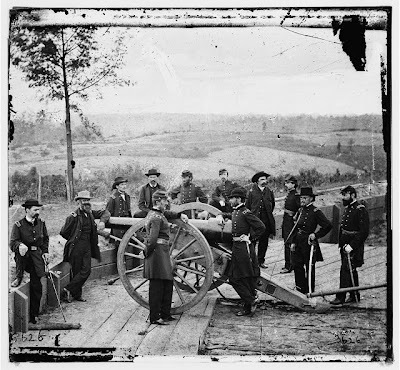 Photo above: oft-seen photo of Sherman leaning on the barrel of a cannon—one of the Barnard photos easily found at the Library of Congress Civil War photos site. Photo below: a picture I took of Ed Bearss at the 11th Civil War Forum Conference, several weeks ago. 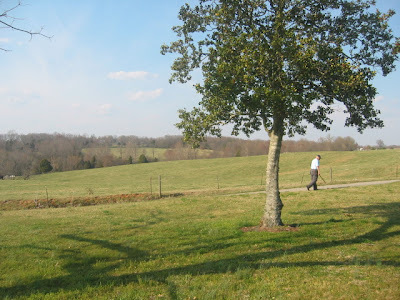 After he had given a rundown of events to that point, as we meandered back to the bus on the high ridge of Hillsman's Farm above Sailor's Creek, I noticed Ed had gotten off by himself and snapped this shot of a reflective moment in the bucolic Virginia countryside. Last week word came from the 13th Historical Clinicopathological Conference (I would have attended, but misplaced my parking voucher) that the 16th president’s head wound was not necessarily fatal by today’s standards. Then, today, came news (from the May issue of the Journal of Medical Biography), that Abraham Lincoln may have been suffering from the effects of Small Pox when he delivered the Gettysburg Address. What will next week bring? Today, paramedics would "scoop and run" with Lincoln. Studies have shown that almost nothing done in the field, other than driving fast, increases survival of victims of head trauma. Doctors would put a breathing tube down his trachea as soon as he arrived at the hospital. He would be given intravenous fluid that is far saltier than blood, which would slightly shrink his brain, relieving pressure. He would get a quick physical exam and a CAT scan of his head -- all in 10 minutes. In Lincoln's case, the images would have revealed large pools of blood that surgeons could have taken out. They would probably remove much of one side of the skull and leave it open but covered. The piece of bone would be "banked" for replacement if he survived. Not only would Lincoln have fared better with the medical technology of 2007, it bears pointing out that he would have fared better with the security that surrounds presidents in 2007 as well, preventing the wound in the first place. No word yet on whether the Washington Post will follow up with an article explaining that the majority of Civil War deaths, attributable to disease, would also have benefited from modern medicine. Heart illness, eye problems and depression are among other ailments modern-day doctors have investigated in the 16th president. But smallpox is the one that might come as the biggest surprise to the general public, especially if Lincoln had it when he spoke at Gettysburg. According to Goldman and co-author Dr. Frank chmalstieg, Lincoln fell ill Nov. 18, the day before giving the speech in Pennsylvania. When Lincoln arrived at the battlefield to dedicate a cemetery for the fallen soldiers, he was weak, dizzy, and his face "had a ghastly color," according to the report. On the train back to Washington that evening, Lincoln was feverish and had severe headaches. Then he developed back pains, exhaustion and a widespread scarlet rash that turned blister-like. A servant who tended to Lincoln during the three-week llness later developed smallpox and died in January 1864. 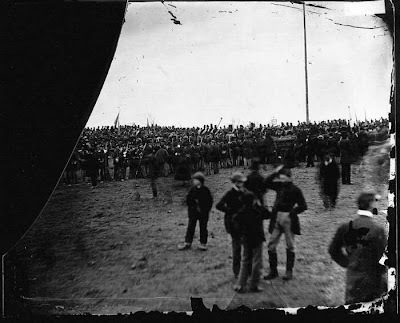 "These modern prints showing the crowd around the platform at Gettysburg and a detail from that picture of President Lincoln on the platform were made from the original glass plate negative at the National Archives. 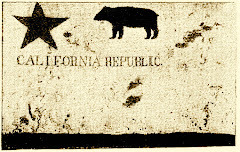 The plate lay unidentified in the Archives for some fifty-five years until in 1952, Josephine Cobb, Chief of the Still Pictures Branch, recognized Lincoln in the center of the detail, head bared and probably seated. 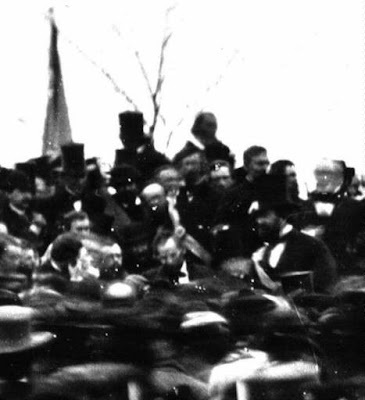 To the immediate left (Lincoln's right) is Lincoln's bodyguard, Ward Hill Lamon, and to the far right (beyond the limits of the detail) is Governor Andrew G. Curtin of Pennsylvania. Cobb estimated that the photograph was taken about noontime, just after Lincoln arrived at the site and before Edward Everett's arrival, and some three hours before Lincoln gave his now famous address." If you think "Stonewall" Jackson covered a lot of ground in his celebrated 1862 Shenandoah Valley Campaign, check out the itinerary of his 1856 European tour. The letter below is one of many Jackson missives that the Virginia Military Institute has made available online. Most of them are addressed to his sister Laura, for whom he had such great affection [Laura will be the subject of the next blog entry here, later today]. You must excuse my long silence as I have been much pressed for time, and now barely hasten to drop you a line. Since landing at Liverpool I have been at Glasgow, Sterling Castle & Edinburgh Scotland, York, London & other places in England; Antwerp, Brussels, Waterloo & other places in Belgium. Since then I have passed through Aix La Chapellr, Bonn, Frankfort on the Main,[? going] ascended the Rhine. From Frankfort I proceeded to Heidelberg and thence on to Baden Baden in Germany, Strasbourg in France, Basle, Lakes Lucerne, Brienze, Thun, Geneva & the city of Geneva in Switzerland, and so on to the great ice berg called Mer de Glas that is sea of ice. I continued in Switzerland for about a week and crossed the Alps by the Simplon Pass as it is called through which Napoleon entered Italy. The scenery of Switzerland is very grand. Upon entering Italy I passed on through the cities of Milan, Venice, Mantua, Modena, Florence, Pisa, Leghorn and finally to this place. With Venice, Florence and Naples I have been very much gratified. 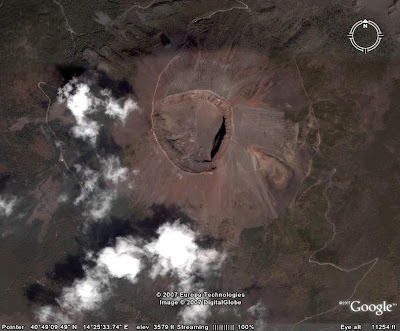 I was at the volcano of Vesuvius last Friday and went about half way down one of the active craters. The scene was truly grand this evening. I leave for Rome. Much love to all. The VMI Archives has done a nice job with their website, featuring much more than their Civil War holdings, of course. While you're there, check out the Jackson photo exhibit. See, also, the Civil War Resources, including Professor Jackson's detailed reporting ("His face, upon the scaffold, was turned a little east of south") on the execution of John Brown. And as you would expect, there is tons of great material on the participation of VMI cadets at the Battle of New Market. Blood-drenched landscapes of unspeakable slaughter don't have to be a buzz-kill. 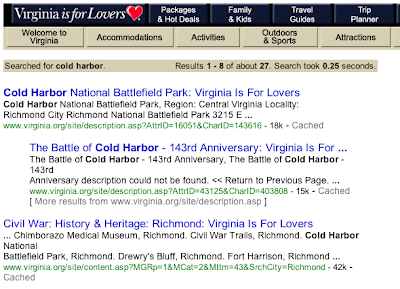 If you think Virginia's Civil War battlefields are somber, joyless places, perhaps you didn't get the memo. Virginia is for lovers. It's right there at Virginia.org. If you pay some outfit to devise a slogan, get your money's worth, and make sure the message is rammed home after every single search result. What's more romantic than the Mule Shoe at Spotsylvania?